The E30 generation BMW 3-series offers one of the better cost to fun ratios for a compact sport sedan -- but modern cars are so bloody fast that you'll find your classic 5-speed 80s sedan getting schooled at the stop lights by an EV Spark. Obviously the answer is to hot rod it...or buy the other guy's hard work for pennies on the dollar. 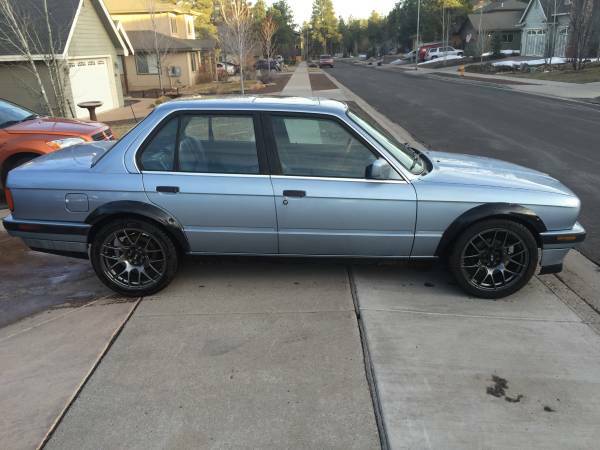 Find this 1990 BMW 325i offered for $9000 in Flagstaff, AZ via craigslist. S52 Engine out of a 1999 M3 auto. Marketmotorwerks did all the engine wiring harness, ecu tune, and there motor mounts. 5-speed trans from a 1999 M3. 11.5 lb flywheel, with unsprung clutch and pressure plate. E46 arm rest conversion. Looks amazing and is so nice to have. Polyurethane mounts, rear subframe and trailing arms, front control arms. XXR 530 rims, 17in by 8.25 with +25 offset. Custom sub box with hertz high energy 12 with JL 750 hd amp. kenwood deck and hertz speakers and amp. New center support bearing and trans mounts. I know that I am missing stuff. 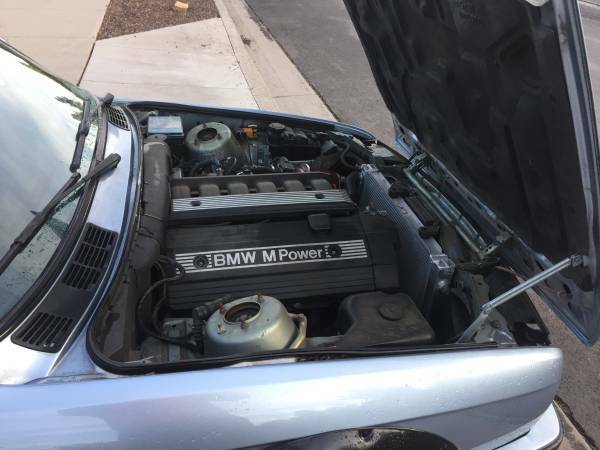 Of course the big ticket item is the S52 inline-6 from a 1993 M3 -- a 3.2 liter DOHC mill that is good for 240 horsepower and 236 ft-lbs of torque mated to a 5-speed manual gearbox. The seller doesn't mention if this has the optional limited-slip-diff, but adding that wouldn't be too expensive or hard to do in your driveway on a weekend. While I m sure this guy has way more into it than $9k, its still a tough pill to swallow with the tattered interior. at $6k, hoon all day. I love that it is a 4-door so I can haul the kids in it. 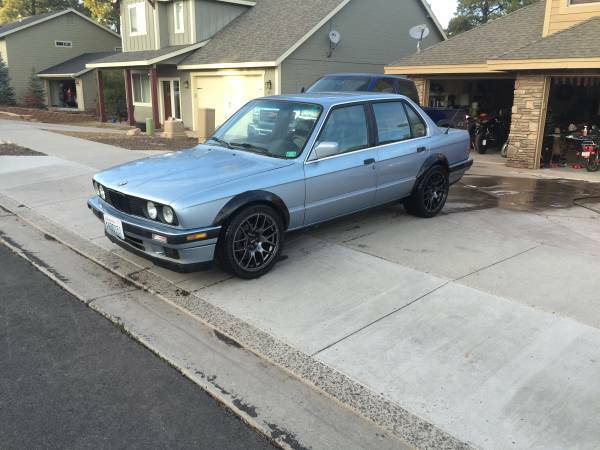 But I really love that it is far away from me so I am not tempted to check it out and offer him $7k for it. Would hoon. Id probably want to make the flares more subtle, i like a sleeper, and some interior love.